The last few years I've been spending my summers and, as you read below, one Christmas, in the forest in central New Brunswick. I bought a large wooded acreage, built a cabin over a summer, and since then I've returned every year, discarding the attraction of the phone and the internet, and immersing myself in the forest. I first lived on the land in a shack I built in a handful of days, although it was November and below freezing every night. By the following summer, I built the main cabin, and I've added to it considerably in the intervening years. I recorded those early days by candlelight; even while I was sleeping in my car in the late fall I was scratching a pencil across a diary of building, living in, and then insulating a shack. I survived hurricanes blowing through the province, sub-zero temperatures, and high water that stranded me on the wrong side of the creek. 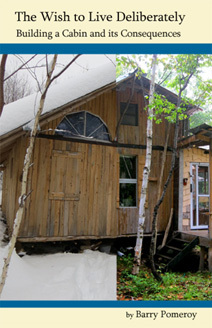 Later, in slightly more commodious circumstances, I brought fingers stiffened by construction to journaling how I built the cabin that came to replace that temporary shack. A number of years later the cabin is nearly done. Although I can always find a project to work on-such as adding to the functionality of my ever-evolving solar electrical system-I've spent much of my time writing, reveling in the chance to read, gardening, and appreciating the animal life around me. I've stayed in the cabin in both summer and winter, and because the experience changes with the seasons, I've maintained a record of those times as well. As if it were the child I detail in my examination of adoption films, this journal collection covers two very different timelines and overall just over nine months. In that way, it is a story about the conception of an idea, the gestation of its building, and the squalling much-anticipated delivery which is the final product of the cabin. Those two timelines are bookends of both a life alone in the woods and a grand adventure in living.